Former fans of Caroline Calloway, Flat Tummy Tea endorsers, and other influencers tell us what it's like to feel scammed by Instagram #aesthetics. There is a belief, parroted in comment sections across the internet, that people who get scammed by influencers somehow deserve it. From the rich kids who spent $12,000 on Fyre Festival tickets to the young women who believe Kylie Jenner’s hair is shiny because of bear-shaped gummy vitamins, people who fall for influencer marketing are often lambasted as “idiots” or worse. This assumption ignores the reality of a highly effective industry. The global influencer market hit $1.07 billion in 2017, and according to a 2018 report by Business Insider, adverts posted by influencers get double the engagement than adverts posted on Instagram by brands themselves. Over the last decade, social media marketing has gone mainstream—yet although we talk a lot about influencers, we hear very little from the influenced themselves. “Of course I feel like an idiot now,” says Alysia Stevenson, a 27-year-old from New York who bought SkinnyMint detox tea three years ago, after seeing multiple Instagram adverts featuring “before and after” pictures posted by reality TV stars. Stevenson’s experiences illustrate how the influencer industry preys on insecure women. Kylie Jenner—who is reportedly paid up to $1 million for a single Instagram post—regularly advertises diet teas to her 126 million followers. But you don’t have to be a die-hard fan who trusts everything an influencer shills to be taken in—it’s enough to be a young woman with an internet connection. “I saw Flat Tummy Tea everywhere on Instagram,” says Daisy, a 27-year-old from Michigan who requested to be identified by a pseudonym because of her eating and dieting issues. At first unconvinced by the adverts that flooded her feed, Daisy spent $160 on the tea when Keisha (a.k.a. Makeup Doll)—an influencer with 231,000 Instagram followers and 650,000 YouTube subscribers—posted a review with an affiliate link and exclusive discount code to buy the tea. This means Keisha received $10 every time someone purchased the tea with her code, as part of Flat Tummy Tea’s ambassador program. While American and English advertising practices now mean influencers have to label affiliate marketing as #ad, these rules were only put in place in 2017, a year after Keisha’s YouTube video. She did not respond to request for comment. Aisling Pigott, a spokesperson for the British Dietetic Association, says detox teas are overpriced “snake oil” and are not linked to long-term weight loss. “In general, detox tea products are part of a confusing, exploitative and potentially dangerous market,” she says. In the UK, influencers making false claims about Flat Tummy Tea have been penalized by the Advertising Standards Authority. 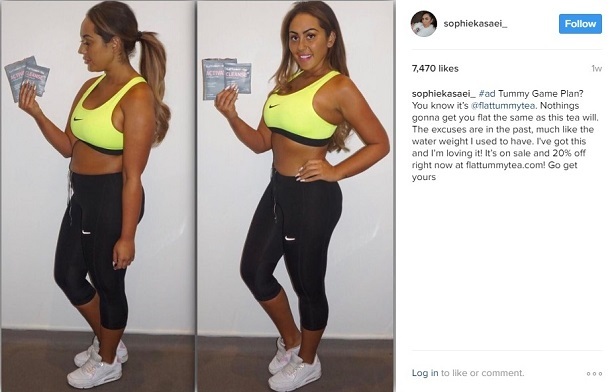 “In 2017, we banned an Instagram post by reality TV star Sophie Kasaei for making unauthorized health claims for Flat Tummy Tea,” says ASA spokesperson Matt Wilson. Kasaei’s post claimed the tea helped her lose water weight. It fell foul of the ASA because the claims she made about the product were not listed as authorized on the EU Register on Nutrition and Health Claims. While this is great progress, nothing at present stops a UK consumer from viewing Flat Tummy Teas adverts posted from elsewhere in the world. The Kardashians—who are regulated by America’s Federal Trade Commission (FTC)—can still post adverts that reach a UK audience. While the FTC have ruled that detox tea adverts have to be labeled #ad, they have not made any rulings against the health claims made by influencers. As the #ad hashtag increases awareness about influencers’ true intentions, perhaps no further rulings are necessary. Stevenson says that she wouldn’t fall for influencer marketing today—yet despite negative headlines, many women still trust social media celebrities who they believe to be their friends. “I enjoyed her prose and her openness… I appreciated her vulnerability… I guess I saw myself in her?” says Abigail Scott, a 31-year-old from California who was a fan of Instagram influencer Caroline Calloway from 2015 to 2019. Calloway hit headlines in January, after she began charging $165 for seminars across America without booking any venues. Calloway promised attendees handwritten letters and flower crowns, which she did not deliver, before asking people who booked tickets for non-New-York-based events to fly to New York to see her there instead. After a backlash, she cancelled her tour and offered refunds (she later reinstated some tour dates and asked people to return the refunds). When asked for comment, Calloway told Broadly: “Everyone’s feelings and experiences are valid —including the people in my community who feel hurt and including the people in my community who still feel connected to the stories that I tell online and in person.” She said she rang Eventbrite and Scott’s processing fees should’ve been refunded, and she is “happy to help” Scott sort this out (she previously blocked Scott on Instagram, but Scott has now contacted her via her personal email address). “I wanted to create a space where the community I have built over the past seven years could finally come together and share the vulnerable stories we’ve always shared online in person and I will keep trying to create those spaces in the future, learning as I go,” Calloway said. When fans like Scott are exposed to a celebrities’ daily lives on Instagram, they can develop what psychologists term “parasocial relationships”—a feeling that an influencer is their friend. This is why influencer marketing continues to work despite negative press. For many, it can take a rude awakening like Calloway’s mismanaged event to lose their trust in an influencer. For others, it’s less about one specific influencer and more about the collective influence of celebrities shilling a harmful product. Regardless, it’s time to stop calling fans of influencers “idiots,” and see them for what, in many instances, they really are: victims of a broken marketing model.